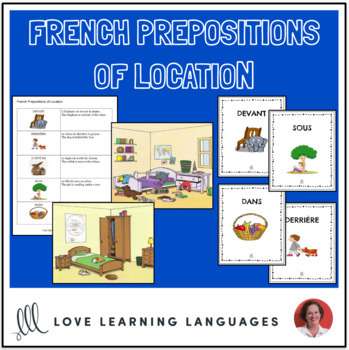 As your students learn French prepositions of location it is nice to have several exercises and activities planned to get in as much practice as possible. This is a reading exercise about a tidy bedroom and a writing exercise about an untidy one. ➯ This resource is included in my Ça y est, je parle français! French 1 curriculum bundle! Give your students the list of French prepositions of location and provide them with the quizlet study set I've made to help them practice and master the new vocabulary. There is a paragraph to read about a tidy bedroom. The idea is to see if students can figure out what it means even if they don't know all of the vocabulary. The prepositions of location are used as context clues. The next part of this activity is to have students write a paragraph of their own about the image provided featuring an untidy bedroom. A list of useful vocabulary is provided and a quizlet study set as well. This list of vocabulary itemizes everything you see in the bedroom so that students can focus on the writing activity rather than looking up words in the dictionary. Students write ten complete statements about the untidy bedroom. Merci beaucoup! Don't forget to click on the green ☆ next to my store logo to become a follower. You will receive updates when I add new products or throw a sale. Go to "My Purchases" and log in. Next to purchases there is a link to provide feedback. Click this link and you will be taken to a page where you can give a rating and leave a comment for the product. When you give feedback TPT gives you credits that you can use toward future purchases.